E45 Emollient Bath Oil is clinically proven to soothe and moisturise dry, itchy skin. It relieves and helps prevent dry skin by retaining the skin' natural moisture. The unique emollient formulation keeps your skin soft, comfortable and relieved long after leaving the bath. Soap and detergent free, perfume free. 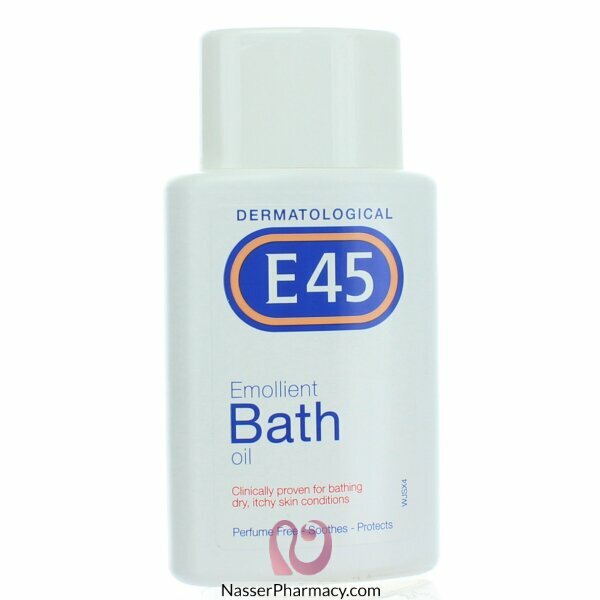 Dermatologists also recommend E45 Emollient Bath Oil for bathing more serious dry skin conditions such as eczema, dermatitis, psoriasis and ichthyosis. Adult' Bath: Using the measuring cap, pour 15ml into a full bath of warm water. Child' Bath: Pour 5-10ml into a small bath of warm water. Use more or less according to your needs. Relax in bath for at least 10 minutes. Shower: Pour onto sponge, massage lightly onto wet skin. E45 Emollient Bath Oil will gently cleanse your skin so you do not need to use soap.